Don’t Ask, Don’t Tell was a horrific policy for many LGBT service members. It took away their careers and sometimes even their lives. 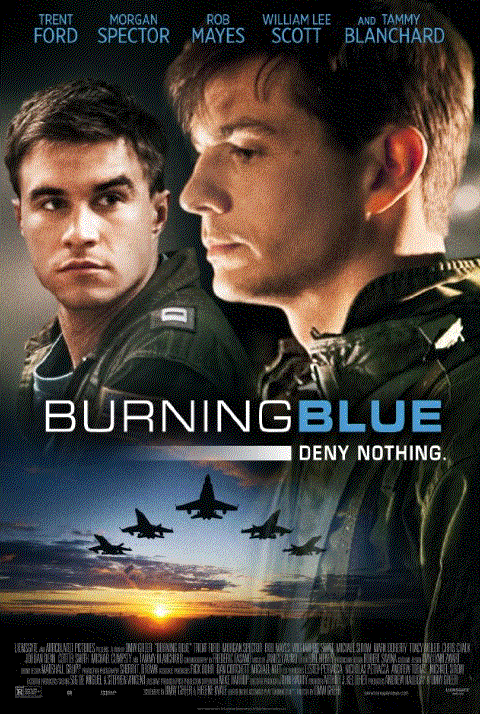 Burning Blue takes an almost documentary look at how that affected a group of people. The synopsis from Amazon is brief: A squadron of male Navy pilots is engulfed by an incendiary scandal after two pilots are accused of having a secret, forbidden relationship. It starts out that there are two pilots Dan and Will – best buddies. There is an accident that is due to Will’s eyesight, and they cover it up. Later they are still in the Navy when Dan meets Matt, and they are the ones that have the forbidden relationship. The Navy finds out, Will finds out, and both dump Dan. I applaud the film for its intentions. This is a story that needs to be told, and needs not be forgotten. Having just passed Memorial Day, I think it’s important to remember the many sacrifices of LGBT service members both in terms of their emotional sacrifices and the fact that they couldn’t live part of their lives – in order to serve their country. I remember watching the many struggles that played out in the media with Don’t Ask, Don’t Tell. Many brave men and women stood up against it, and we will forever be in their debt for their bravery. I just didn’t feel like this movie captured it as well as it could have. It told the story, but when it could have drawn the viewer into that world it held back. Dan and Matt’s relationship seemed surface level at best. There are parts towards the end where you would have felt what Dan did had you known more about their relationship. It left me a little confused, sort of like when they stared at each other for long periods of time that was supposed to communicate.. something. For instance they were out jogging and ran into one another, but they stared at each other with a slight turn of the head like when I tell my cat she can have tuna. There is also the relationship between Dan and Will which has it’s own complications. But it seems like just as the story gets going and we get to the meat of it, we don’t go any further. There’s a lot of set-up, and not enough follow through there. Perhaps this is meant to show the emotions left in the people that Don’t Ask, Don’t Tell affected. We are left in a state of wondering “what the hell happens next?” I think that in itself is poignant and worthy of the story. I just wish it had gone a little deeper into the characters and less about the odd government officials and Will’s eyesight.